This car was named European Car of the Year for 2014 and although I was sure this was going to be a nice car, I wasn’t quite ready for it to steal my heart. It’s one of those cars that is a good all-rounder and I, perhaps naively, expected it to be a bit boring as it had won such an award. I expected a car named car of the year to be simple, easy to drive but lacking in excitement but that’s definitely not the case with the Peugeot 308. The first test of this car was on one of my favourite roads in Norfolk between Swafield and Knapton. The 1.6 BlueHDi engine is fantastic. There’s a bit of a delay before the turbo kicks in (around 1500rpm) but once it does, you get the kind of power that makes it very fun on windy country roads. The centre of gravity is low too which makes it very fun to throw around corners. It’s not the kind of car you’d buy to drive for fun but if you’re going to buy this car for it’s looks, MPG or comfort, then you’re going to get some fun out of it too. The car is sleek, well-proportioned and has this understated charm that just seems to radiate from it. 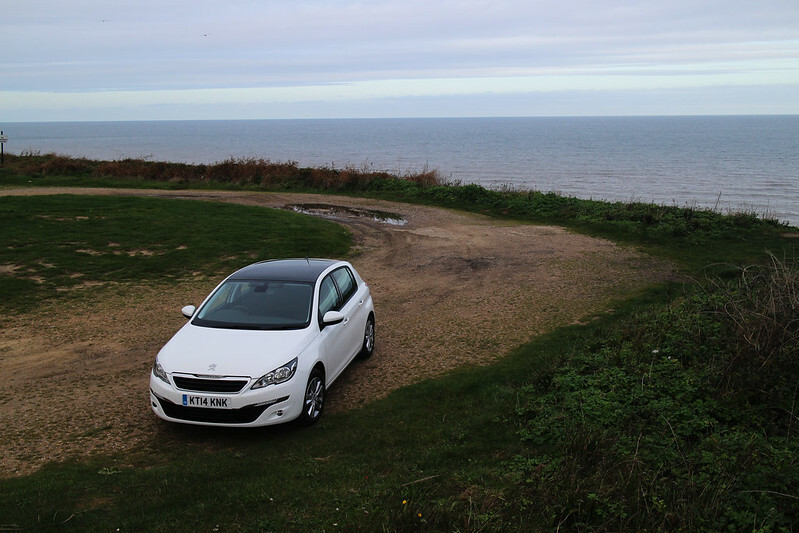 By the time I took these photos on the cliff tops at Mundesley, I was already having strong feelings for a car I was ready to be a little bored by. A smaller steering wheel, fewer buttons and a fantastic touch screen computer make up the interior of the Peugeot 308. The steering wheel takes some getting used to and at the end of my week with the car, I still wasn’t sold on it. What I do love, though, is the lack of clutter in the cockpit. There’s nothing to distract you from the road. Over the last few cars I’ve driven, I’ve come to realise that this is most definitely my preference when it comes to the interior of a car. 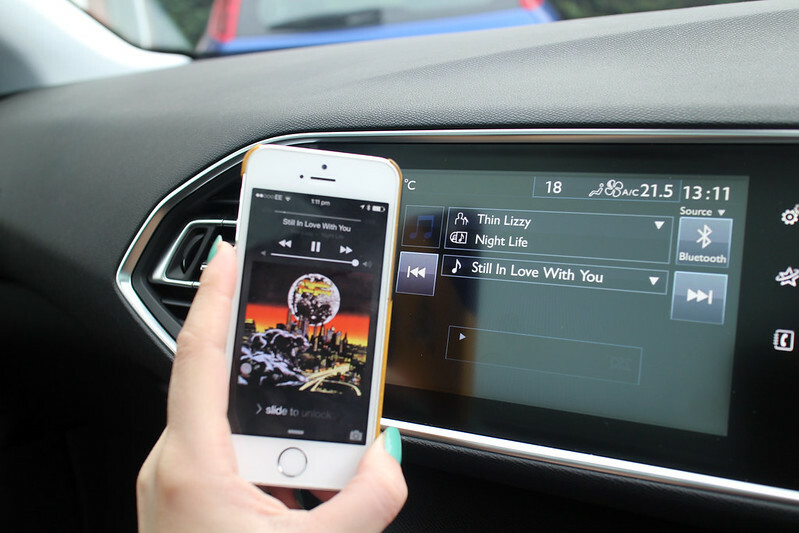 The computer is easy to use and I’m never not going to love being able to play the music of my choice via Spotify through a car’s speaker system. The only thing I did find a little confusing was the air con and heating, I didn’t spend enough time reading the car’s manual to work it out, a lot of pressing buttons (well, the screen) and I eventually made the car the correct temperature. The panoramic roof is another amazing feature on this car. It’s not exactly helpful or fun for the driver but when stationary, it’s lovely to look up at the sky and my passengers certainly enjoyed it as we drove to The New Forest. It also lets loads of light into the car, which is wonderful for a road trip in the sunshine. 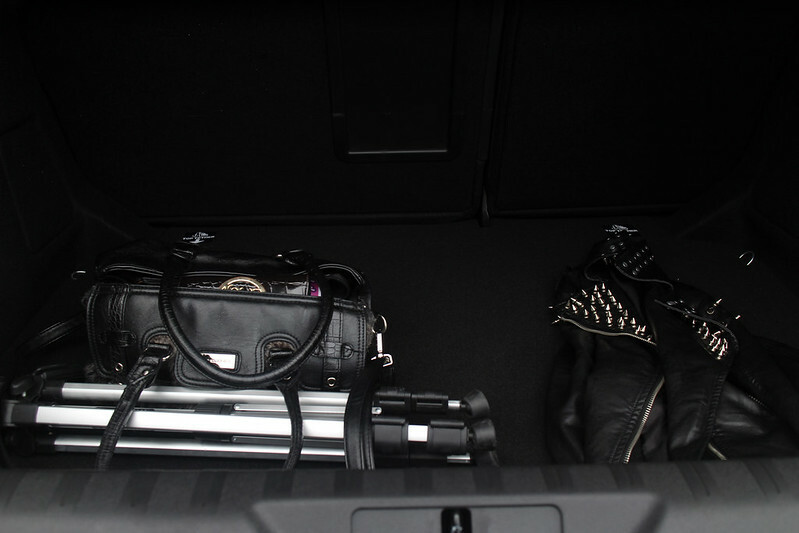 Five doors, a large boot (470-litres), lots of leg room and a comfortable ride makes this car very practical. Interior storage is lacking somewhat (small glove box, only one cup holder) so that rules this car out as a viable option for a family with a couple of kids. There are a nice amount of features that come as standard, though, and you don’t need to fork out a huge amount of money for the Feline or Allure trims to get things like a rear parking aid, electric handbrake or DAB digital radio – all these come as standard on the Active trim. There’s stop start technology that turns the engine off when you’re in traffic or waiting at lights this helps to bring the fuel economy up to 91.1mpg for the 1.6 BlueHDi engine. I drove to the New Forest and back from Norwich (and I’m far from economical when I drive) and there was still plenty of fuel to spare. The 2.0l BlueHDi engine will do around 74mpg. With Co2 emissions of 82g/km, there’s no tax to pay on the car, further reducing running costs for drivers. The Peugeot 308 5-door 1.6 BlueHDi Active costs £19,440. Previous ArticleIs car finance really worth it?